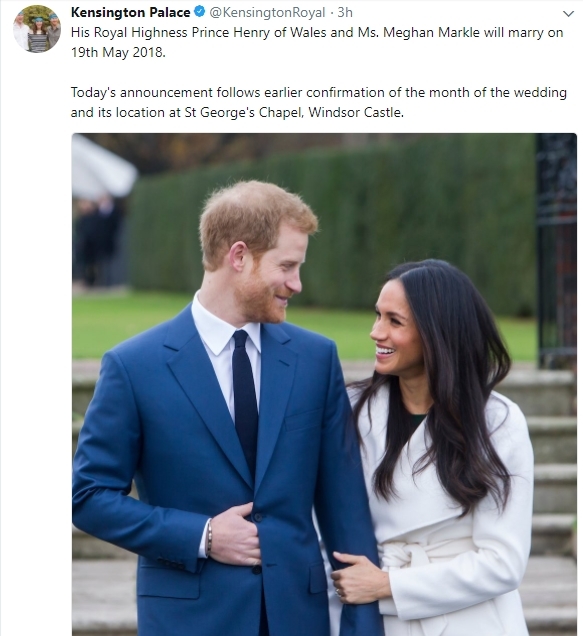 In fabulous Friday news, Kensington Palace confirmed Prince Harry and Meghan Markle will marry on Saturday, 19 May, at St George's Chapel at Windsor. 'Harry and Ms Markle have gone against tradition by choosing a Saturday. 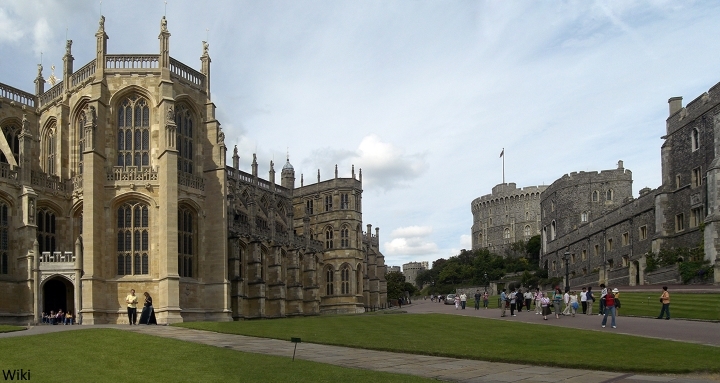 Royal weddings usually take place on a weekday. The Duke and Duchess of Cambridge wed on a Friday and the Queen on a Thursday. But Harry and his fiancee's choice avoids the issue of whether or not the royal wedding should be a Bank Holiday. The May wedding will also have been picked to give Kate time to recover after the birth of her third child, which is due in April. 1536: Anne Boleyn, second wife of Henry VIII and mother of Queen Elizabeth I, was executed on Tower Green for alleged adultery. 1588: The Spanish Armada set sail from Lisbon. 1802: The French Legion d'Honneur was created by Napoleon. 1898: William Ewart Gladstone, four times Liberal prime minister, died at Hawarden Castle in North Wales aged 88. 1900: Britain annexed Tonga, the Friendly Islands. 1906: The 20km Simplon rail tunnel, between Switzerland and Italy, was officially opened. 1935: T. E. Lawrence (Lawrence of Arabia) died six days after a motorcycle accident in Dorset. 1982: Italian actress Sophia Loren was jailed for a month for tax evasion. The Mail Online reports Harry and Meghan will be married by the Archbishop of Canterbury: "The Archbishop of Canterbury is expected to marry Prince Harry and divorcee Meghan Markle. In an interview on Radio 4’s Today programme yesterday, Justin Welby declined to say whether he would officiate at the service, saying only that it was ‘up to them’. But it is believed that he has, in fact, already agreed to marry the couple in St George’s Chapel at Windsor Castle in May. Sources say the leader of the Church of England has even had initial discussions with the Queen’s grandson and his bride-to-be about the ceremony and apparently found them ‘delightful’ and ‘totally committed’ to each other." It is also reported he will join the couple for a series of pre-marital counselling sessions before the big day. 'Most Revd and Rt Hon Justin Welby, who was named the Archbishop of Canterbury in 2013, has met Harry several times and says that the couple is not going through with a grand religious service out of a sense of tradition . 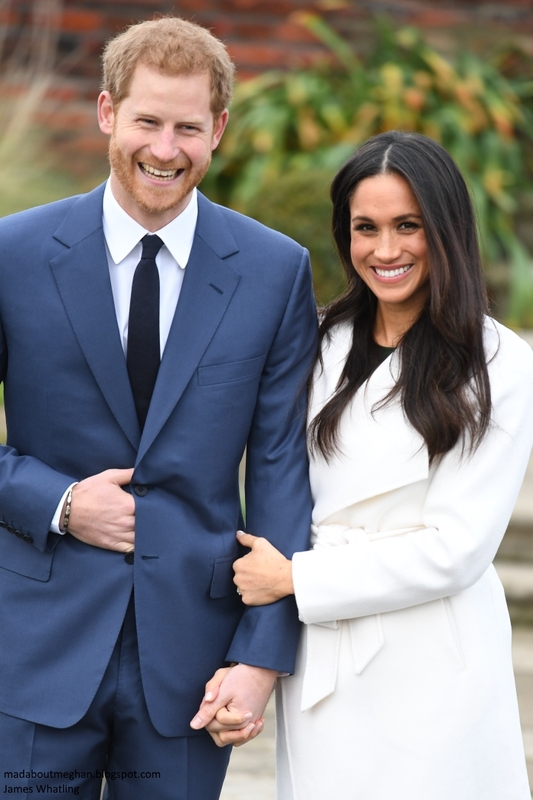 Kensington Palace Communications Secretary Jason Knauf said the day will reflect their "characters and personalities" and added they want their wedding to be "fun and joyful" and involve the public. It is understood the wedding will be televised and broadcast all over the world. Harry and Meghan are completely in charge of planning the event and will be very busy in the coming months with preparations for what promises to be one very memorable Royal wedding. It is such an exciting time; I'm delighted for both of them. If you're just joining us, Meghan attended two Royal household parties this week. Read all about them here. I usually sleep late on Saturday but this will happen before dawn in the Eastern US. My birthday is the day before, Anon 15. 🎂Happy Birthday to us🎂, lol. Wishing you both a very Happy Birthday of 2018. Mine is past those days. SG- You are very welcome. I am a May child also, may be another reason I like emerald. Thanks Charlotte. :) Travel safely. I am surprised they didn't choose May 28. That's a bank holiday weekend, right? wow. you are right Imke. I never thought of that. They are definitely taking it to the wire huh? Why does she need to be married within 6 months? Lol I am sure that won't be an issue. And even if it was, it wouldn't make any sense for the 6 month period to start running from the day they announced their engagement, it would be from the day she moved to the UK. Lol, the countdown doesn’t start from the day they announce the engagement to the public. It starts from the day she officially applies for the fiancé visa at the consulate/embassy. May 28 is a bank holiday weekend in England, but it is also Memorial Day weekend in the United States. May 28 is Memorial Day this year. Given Harry's support for the armed forces and the fact that Meghan is American, it might have been seen as disrespectful for them to get married on a day in the United States that is meant to commemorate the men and women who have died in service to their country. very good point, 19:17. I hadn't thought of it that way. It depends on the type of visa she applied for. If a fiancee visa at least in the US it is 90 days after you set foot in the US. I do not know what the immigration laws are in the UK but it would not involve an engagement date but would center around a visa date or landing in the country date. Fantastic news! May can't come soon enough! lol. That Harry and Meghan are to wed is official now, relax, because Kensington Palace and Buckingham Palace are now selling in their gifts shops, mugs and gold-played spoons with Harry and Meghan's pictures on them. No more doubt. No more anxiety, lol. It is truly now official. 🏰 Upon reflection, I guess choosing a Saturday does take into consideration people who wouldn't otherwise have the convenience of a bank holiday to more fully enjoy the wedding. I will be up all night watching if it's 11:00am as usual. I hope it is; I have a tradition of staying up all night to watch royal weddings. Sounds fun, bluhare! I don't think I'd make an all-nighter (with my luck I'd try to stay up all night but then fall asleep right when the actual wedding began! )...but I do plan to watch the lead-up hype late into the night, quick catnap and then wake up early to begin the wedding watch. I think I woke up at 4am for W&K's wedding so will do something similar. Can't wait to watch and chat with everyone here. I did the same w/ Diana and Charles and then William and Kate. =) I'm in California so it is definitely in the middle of the night here when they marry. I recall I enjoyed at glass of champagne at 4am while watching William and Kate's wedding :) I think I'll be doing it again in May! Glad to see there's other night owls! I will be glued to my tv and phone tweeting and commenting! I'm glad it's a Saturday so I can watch it without having to take the morning off work! Me too. I was already planning on asking for the day off! LOL. Likewise! No need to take the off. Okay. Meghan has had tea with the Queen and corgis. 👑🐾 They love Meghan. Meghan has been given an invite to attend family Christmas festivities at Sandringham 🎄(and most likely the Queen's lunch also prior to Sandringham). Unprecedented. Meghan has helped the Queen, yes, helped the Queen, greet Royal Household employees (the people, the real glue, that holds the Monarchy together.) The Queen has allowed Meghan to establish a good foundation there and quickly. Unprecedented. How they eluded the media in all that getting around and busy ness is also nothing short of a miracle. We are definitely going to need running shoes 👟 to keep up with these two I think. It is amazing and phenomenal, yes, phenomenal, really how much Meghan has not only assimilated already into the family BUT how she has done it in such a widely comprehensive way and all in 18 months. lol. Think about it. Highly unusual and unprecedented for sure. And the wedding is still five months away. There are so many layers to this couple. So happy they have been able to create their own happiness and space within the media madness and social media rumors and lies. So happy for them. Huzzah! Soooooo exciting. The only sad thing (just for me, personally, lol) is that I have vacation plans to be in England for 2 weeks in May...however not on this day :( so I won't be able to go and scream my head off as the newly married Duke and Duchess stroll by. Boo hoo. I really figured I had a good shot for my vacation overlapping with the date...but oh well. I'll for sure be watching on TV though. I'm curious to see what the TV coverage will be here in the US. It had better be wall-to-wall coverage of every.detail. My daughter is so disappointed as well, She will be in London studying until late April but booked her flight home on May 12 in order to spend a couple extra weeks after school ends, now she wishes she’d booked it for later in the month, But perhaps it’s good for me as I think this indicates Kate is due more the middle of April and I’ll be in London and traveling around England from April 11 to 21 and have been hoping the baby comes while I’m there, had originally planned to be in London the whole 10 days but husband wants to see the countryside. We are also going to London for 8 days in January and I’m hoping for a Kate sighting then! Yay!! Now I can finalize my trip! My brother and I planned to go to Amsterdam in the spring but, once the engagement was announced, he knew exactly where I planned to go instead! Looks like we can begin finalizing arrangements! LOL! US reader, Congratulations on your daughter's wedding. You mean your daughter's wedding is the next day, in less than 24 hours? When the day gets there, chances are you may be absorbed with your daughter's wedding. The video copy of H&M wedding will be available on line. Enjoy the wedding loaded weekend / Best wishes to your daughter. Repeat to yourself, "our family wedding plans are perfect for our family" as often as necessary to ward off any feelings of, "oh, that's such a good idea for a wedding! We could do that!" as you watch H&M. And congrats to your daughter. May she and her husband share a long life of love and laughter. Congratulations US reader. Wishing all the best for your daughter and her husband. If they were to plan their wedding day based on events of world history, they could have found some other better days in May. Days of the month in May are a mixed bag of good and bad. It all depends who is observing the day for what history. At least, the year 2018, May 19, will add a positive event to world history events of the same day. A day of marriage is special; what happens after that is a different matter, or astrology might have figured it out in its own world. The Bishop of Canterbury is convinced positively about the marriage; let that be the seal of a blessing along with the support of their families. The sweet nature of love is like the sunlight; its energy is positive. The couple is in their own world right now at least. They most likely have their own reasons to choose May 19 as they make their own history. Is it too early to be speculating as to who will design the dress? And just as importantly, which tiara will she wear ? :-). I wonder if Harry will have a tiara made for Meghan, something new and modern, that reflects her personality. Annabel,it would be wonderful if we will see a tiara made from old jewels of the Royal family,I prefer a minimal tiara -Only Her Majesty knows,because she will decide!!! Annabel. Don't rule out Jessica Mulroney's influence in Meghan's choice of a wedding gown. Why? "Fashionistas, WAGS, and Windsors. Meet Meghan's new Brit Pack", The Telegraph, Eleanor Steafel, 12/14/17. I would like to see her choose an American designer as a nod to her heritage. What a lovely idea, to have a close friend help design your wedding dress, someone who knows you so well. I read that Meghan favours the romantic style wedding dress, so I can imagine, with that idea in mind, and as well as keeping in mind the venue, the dress will be nothing less than spectacular ! Hope Harry with Meghan's input design's a versatile tiara (something similar to Sofia of Sweden's wedding tiara) using elements from the Royal vaults, as well as using some of his Mum's private collection. That would make it oh so special ! I just hope it's not Erdem. surfer girl-The Spencer tiara is only for the brides of the Spencer family,so I don't hope we will see it on Meghan! @Annabel, re: wedding dresses. I'd love something by Phillipa Lepley (http://phillipalepley.com/the-dresses/). Her dresses range from sleek and more simple to more embellished. I feel like her aesthetic would definitely mesh well with Meghan's. Also, she's a British designer, so checkmark there. I feel sure Meghan will choose a British designer. And definitely not that Israeli designer who is pushing her (his?) sketches out to all the media, claiming a request was made for a dress sketch. No way would Meghan choose a designer who can't keep their mouth shut at this early stage. IMO, this designer is only pushing themselves forward to get some free publicity. Also, what connection would this designer have to Meghan, Canada, US, or Britain? I don't think she'll choose a non-Brit designer! @Annabel, p.s. re: wedding tiara - I am actually now hoping for the Queen Mary Fringe. I read some article reasoning why Meghan might be loaned this one and it made a lot of sense to me. Primary reason was that the queen doesn't really wear it that often and since it was her own wedding tiara (and Anne's first wedding), it might show a real signal of acceptance of Meghan into the family. Also, I feel like the minimalist style of it would suit Meghan's style. My other favs are to have one of these two necklaces converted into a tiara. Either, the queen's Godman necklace, with the dangling emeralds removed and turned into a demi-parure of necklace and/or bracelet: http://i.dailymail.co.uk/i/pix/2016/06/12/23/339FDE6C00000578-3638079-image-m-14_1465769464474.jpg This one could even be convertible, with the emeralds swapped out for diamonds. In the Kitchen. Not to mention that there is a dress code at the Windsor chapel. From what I've seen of the Israeli designer I doubt her designs would even make it onto the grounds of the castle, lol. It is not burlesque. It is a church wedding. IntheKitchen. You have "Tiara Think". It is a gift, lol, and I love it. Great news! I am sure they will put together a warm, poignant, and unique event. My best friend just asked me if I want to join her in flying to England that week. Haven't been since 1986... hmmm. Would love to see you there! But will they go to BP? You know what makes me as excited as the wedding? Knowing that SG, Eve an hopefully others will finally meet in person. That is awesome! And then to share the wedding excitement with each other there? PRICELESS!! I can't wait to start speculating on wedding dresses and wedding tiara choices! I'd love to see the Strathmore Rose tiara make an appearance and given Meghan's love of flowers to would be a wonderful choice. I’m already speculating on dresses and tiaras. LOL. The Strathmore is a good choice, though I was thinking of the Queen Mother’s bandeau if it’s still hanging around or maybe a new one since Kate got Diana’s ring and has been using the Lover’s Knot tiara - it would be nice to have something that is all hers. I'm still waiting (& hoping) that we'll see the Strathmore Rose tiara soon...that is a beautiful tiara. Maybe we will see it atop Meghan's head at her wedding. It will be a long weekend in Canada for Victoria Day. Makes it easier for all her Canadian friends to travel. Ooh I am sooooo excited!! Meghan will be such a beautiful bride I can't wait to see her dress and how Harry looks at her and the first kiss!! How can we all blog and chat and IM together during the wedding. Private FB group? In no way do I want to detract from this blog but it would be nice to be able to ‘chat’ with each other live during the wedding. So excited. I got up to watch W&K tie the knot and I will H&M too. I think she is also likely to go with a Canadian designer. Weeeee!! The fun! The bling! The romance!!! That will be such fun. I guess I will have to stay up all night, as the wedding will take place around 2 or 3am! Yay - thanks, Charlotte. That will be great to be able to post live on the day. I'm so excited!! I am so excited for May 19 to get here!!! As others have said - won’t have to take time off work!! Yay!!! Of course, my husband just rolls his eyes at me. Can’t wait to see her dress!! Surfer Girl - very jealous - hope you have a group of the bloggers meet up. If you do, a picture is a must!!! Congrats to the happy couple and yea for a finalized date! It will be a lovely day! Charlotte, thank you for the update! 2018 will be a busy and exciting year! Hi Kate, I definitely think there will be a carriage ride through Windsor and I'm hoping for a kiss on the steps of chapel. Kate, unless security dictates otherwise, I suspect it will be similar to Edward & Sophie's wedding. I recall coverage of cars being driven to Windsor Castle as well as the bride and groom's carriage ride down the main road in town. This is wonderful news! I must say that Harry's previous girlfriends were just that, girls, whereas Meghan is a grown woman with life experience and poise. I think they will make a brilliant addition to the royal family. They were just girls, Royal Watcher. Meghan is a mature and responsible 36 year old professional. An accomplished woman, and financially independent. Merry Christmas and Seasons Greetings to all of you and your loved ones. Surfer Girl, Thank You very much. I hope to stop by here next year. I like your trees. Enjoy the holidays. Tedi, Merry Christmas and Seasons Greetings to you and your loved ones. I am so excited they announced the date finally, but also SO disappointed they chose a saturday 😞 as a religious jew, I don't use any electricity on saturday, which means I won't be able to watch it live... This will be the second time I miss a major royal event - Charlotte was also birn on a Saturday. Still extremely excited about the wedding. I'll just have to catch up later. I do understand the logic behind choosing this day, and avoiding the holiday issue. Looking forward to seeing them at the queen luncheon and, of course, on Christmas day! I will be thinking of you and anyone else who is unable to watch for various reasons on the day. At least we have Christmas day to look forward to though - that's a lovely, welcome change. It is all so super exciting! I am looking forward to every.single.detail! Just splurged on my plane ticket, SG. I hope there will be a MadaboutM viewing party in London! The Daily Mail, Siofra Brennan, "When Harry Interviewd Barak", 12/17/17. I can't wait to see the interview! Harry seems so friendly with both Obamas...I really feel sure they will be invited to the wedding!! I can't wait to see if they are attending, and in the future, to see the 4 of them at some event together working on important causes. Seeing as how Harry basically copied the idea for Invictus from the US Warrior Games I wonder if Meghan might start something similar to Michelle O and Jill B's Joining Forces. I'd really like Meghan to do something with the families of veterans since Harry is so involved with veteran causes. It feels like it would be the perfect adjunct for Meghan. I agree, IntheKitchen. I was going to say perhaps it would be better for her to do that if she herself was also a veteran, but Michell and Jill are not veterans either so it would work. I don't think Harry has any blood relation to King Henry VII...? Penny. 👑 I thought so, lol. Harry is most definitely related to King Henry VIII. He is Harry's 14th great-grand uncle through Edward VII. The blood relation between our Harry and Henry VIII is very remote. If anything, Harry is probably more of a Stuart. IMHO. Genomes are tricky and clever. If they want to pop up from a remote gene pool they do. That's an inherent reason lineages are so diligently recorded. Let’s hope nobody inherits Henry VIII’s penchant for multiple wives! I agree. What a nice thing for them to do, and £1800 for that organization too! There are comments on articles in the Daily Mail accusing Meghan's mother of being a felon who was in jail for years. They are calling Meghan a globalist Obama-lover (as if that was a bad thing). I've never seen anything like it. It's so extreme. I know these people may not be in the majority, but there are a lot of them out there going by the up votes on the comments. I was just wondering if you think this will become a serious problem going forward because these people do not work with the truth, but social media enables them to spread their poison unchecked to fellow racists and nutters who want the lies to be true. I find it very concerning. Prince Harry has been appointed Captain General of the Royal Marines, succeeding the role from his grandfather. What an honour for Harry! Prince Philip looks proud of him. I was so glad to have found the photo! For some reason, I keep thinking about HM and PP being ill this time last year and I've been hoping they are OK now. Apparently, they are.